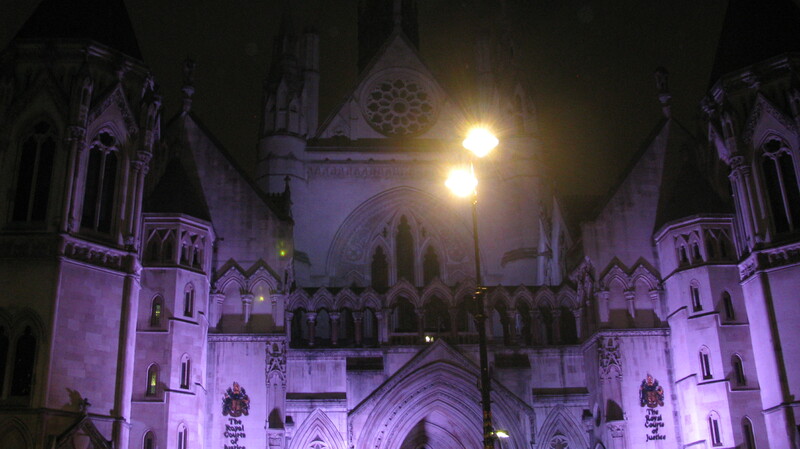 I love wandering around in London. Last Friday when the better half suggested a date night I jumped at the chance. I started off the night by stopping in the pub Ye Olde Watling to read some of the Charles Dickens’ novel that I am currently enjoying. I treated myself to a half pint of Guinness while waiting for my date to arrive. It was fun sitting in a pub that has so much history. 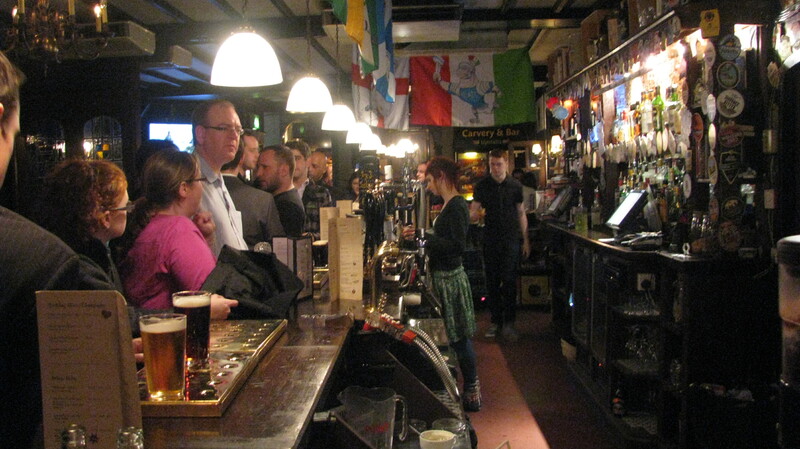 The claim is that Sir Christopher Wren used old ships’ timbers to construct this pub. It dates back to 1668. Another claim is that during the construction of St. Paul’s Cathedral, the upstairs of the pub was utilized as a drawing office. I am a little behind in my reading. I was hoping to be done with Nicholas Nickleby by the end of February. However, I am only 500 pages in, leaving over 200 more to go. 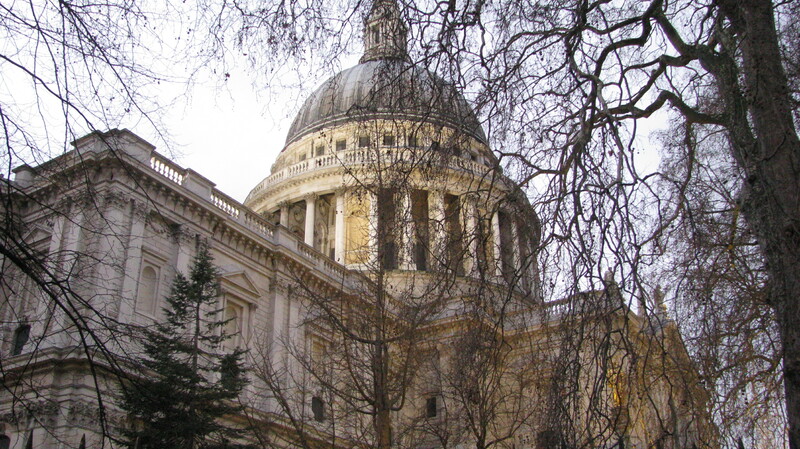 Once my date arrived, we headed towards St. Paul’s Cathedral. 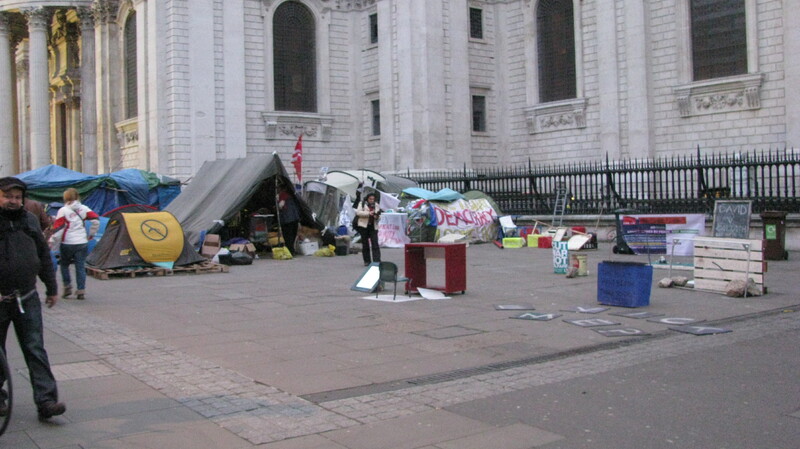 There were remnants of Tent City outside of St. Paul’s. On the following Monday, during the night, the rest of the tents were removed. 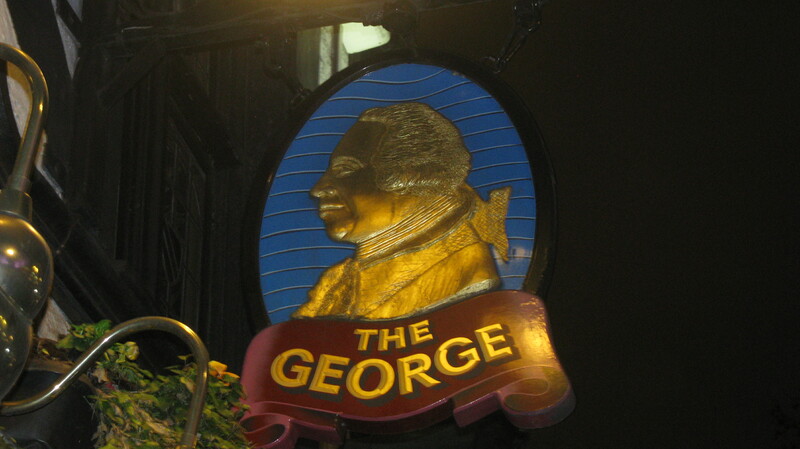 We popped into the pub, The George, founded in 1723, to sample some brews. 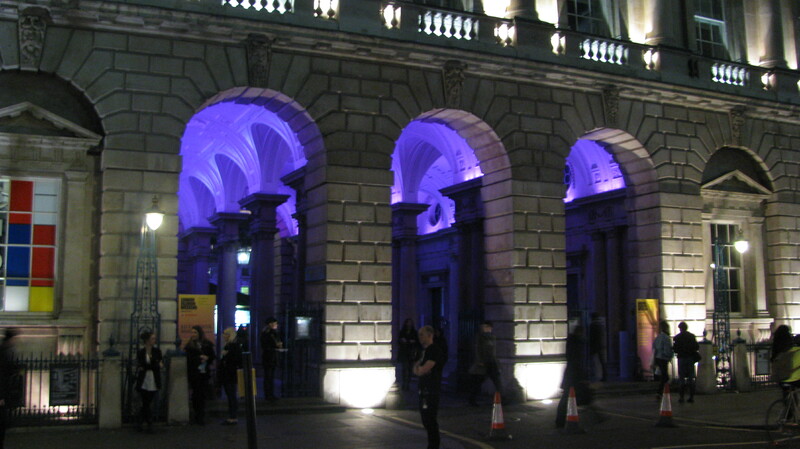 Fashion week was occurring at the Somerset House. 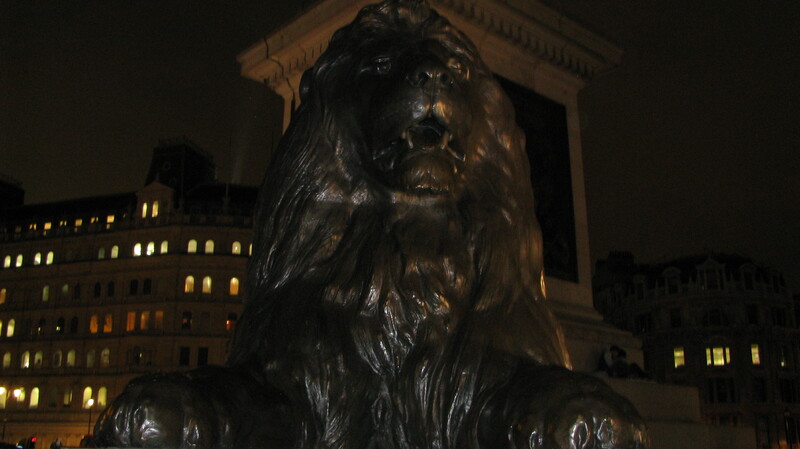 Then we walked by Trafalgar Square. It is beautiful at night. We had a delightful night! This entry was posted in London and tagged Charles Dickens, City Life, Date Night, England, English History, English Landmarks, English Pubs, Friday Night, Life, London, Photography, Photos, Royal Courts of Justice, Sir Christopher Wren, St. Paul's Cathedral, The George, The Life and Adventures of Nicholas Nickleby, Trafalgar Square, ye Olde Watling. Bookmark the permalink. It was great fun! Thanks! Looks like a great date night. The pub shot looks like one of the scenes in the movie COCKTAIL starring Tom Cruise. I did a post on the Occupy Pittsburgh movement here. I didn’t know they had Occupy Pittsburgh as well. I heard about the ones in NY and CA. I’ll check it out. Thanks. 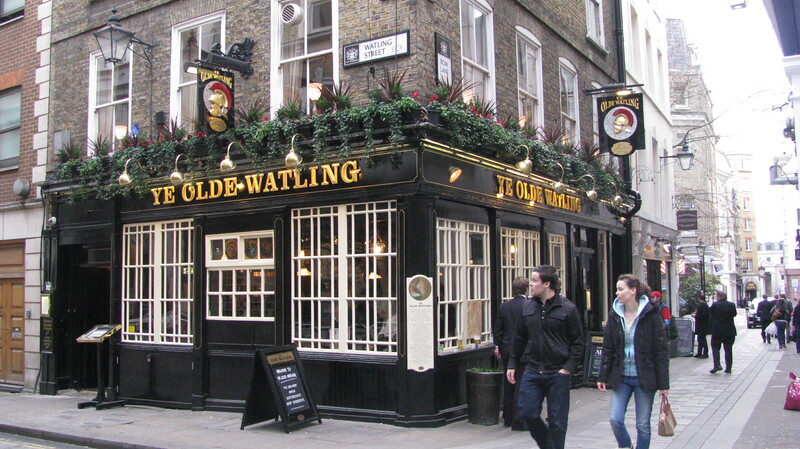 I really enjoyed Ye Olde Watling. 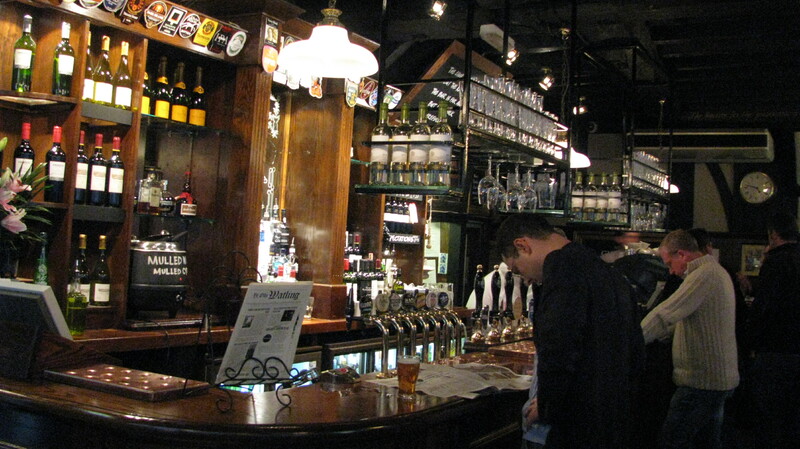 It was actually the first pub I popped into when I landed in London. I had to wait for my room so I enjoyed lunch and a drink and tried to wake myself up after the flight. How wonderful! Now that’s what I call a date night! There is much humor here! I’m glad you like them. I enjoy your photos from Minnesota. I’ve never been there. I am really enjoying the pubs. So quaint and full of history. I’ve never been to London, but after checking out your awesome pics, it’s suddenly risen higher on my “Cities To Visit Before I Die” list. Thanks! We just moved to London in September and we love it. I hope you get to see it! This is fantastic! How long are you in London for? Thanks! We are here for at least two years. My better half was relocated for work. Oh, how wonderful – looks like a great date night! Now THAT is a good date night! And what a cool place to hang around waiting for your date to arrive! So glad you are taking advantage of the coolness of your current living situation. I love that pub. This place is too much fun to sit at home all of the time. The George is fun. And the view outside is amazing. I hope you have a ton of fun and I can’t wait to hear all about it! 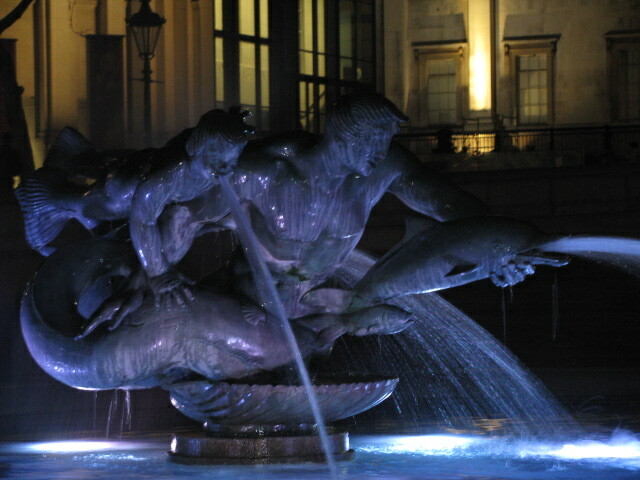 London by night..aaah! Will be over there in about a week, so am very excited! No it isn’t. I’m not sure what will happen next. It will be interesting to see if the protesters try to set up camp elsewhere. There is nothing like English pubs, I think. I like them very much. Although not a beer drinker I do like Guinness. Guinness is one of my favorites. I’ve only started drinking beer over the past couple of years. I’m a little picky, but it is fun to try new ones. Fortunately my better half loves beer so if I don’t like one that I’ve ordered I just hand it over and order a cider or tea. What a grand night out, I’d love to sit in Ye Olde Watling with a Charles Dickens book and half a pint of Guinness. It was delightful! Such a great start to the night! 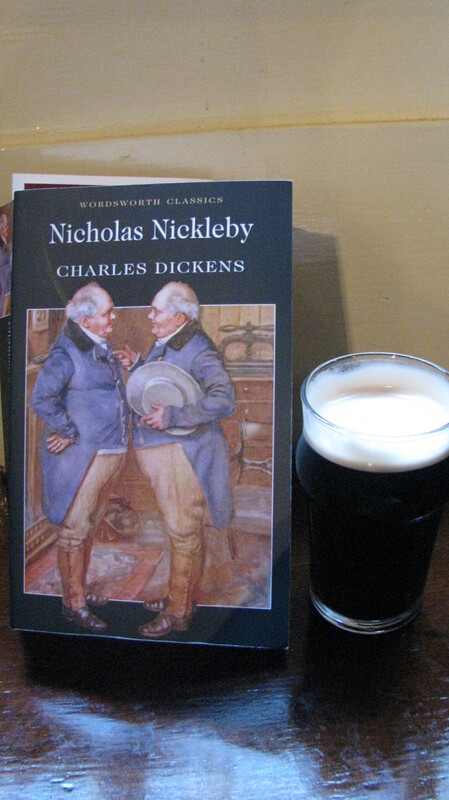 Dickens + Guinness? Good combo 😉 I prefer snakebite though ! Snakebite is pretty tasty as well. I’ve had it a few times. I love cider.